The Castro family, led by father James and mother Marie, is rapidly becoming the first family of track and field for West Virginia. Noah is already a household name in the United States with his remarkable resume. Barkley has just come off a state championship performance in the 800 meter. Braxton is a rising freshman, and Rowan is just beginning his career. Recently Barkley a rising senior from Winfield High School ran a new season best time of 5:35.21 in the 1500m at the WV USATF Track & Field Championship, placing first. She also ran a time of 8:40.22 in the 2000mSC, placing first. Barkley ran a PR of 2:17.57 in the 800m at the West Virginia State Championships, placing first to become a West Virginia AAA State champion. Recently Noah ran a 10:29.47 in the 3000m and a 4:52.52.72 in the 1500m placing first in each at the WV USATF Track & Field Championship. Noah ran a 4:57.37 in the 1500m at the 2013 West Virginia AAU District National Qualifier, placing first. He also ran a new season best time in the 3000m in 10:21.02 at the 2013 West Virginia AAU District National Qualifier, placing first. Daddy Doug: What are the ages of your kids? James Castro: Barkley is 17 and will be a senior next year, Braxton is 14 and will be a rising freshman, Noah is 10, and Rowan is 5. Daddy Doug: What are their goals? James Castro: Barkley’s goals are a top 20 in Cross Country and 2:13 in the 800 meter run. She said her ultimate goal would be to run for a Division I school. Braxton- He's more laid-back and conservative. He said "making varsity as a freshman would be a nice goal". He has grown so much this summer; I'm curious to see if it hurts or helps him. He is already 6-0ft tall and wears a size 12 shoe. Noah- He's the most competitive kid you will ever talk to. "I want My 1st Outdoor National Title, a cross country title, and to run 17:25 5k (his pr is 17:48) before I turn 11"....". Oh yeah, and another goal is to make straight A's ". Rowan- to have fun on his last summer before kindergarten! Daddy Doug: I see where Barkley won the steeple chase in the WV USATF meet. Noah had a PR in the 1500m and Rowan is competing against the older guys. James Castro: Yes, Barkley was on her third day back from a 2 week rest and really just wanted to qualify for the Regional (national qualifier) in the Steeplechase and 1500 meter. I talked my son Braxton into running it with her. I wanted Noah to take it easy in the 3k so he could go after a PR in the 1500m! I didn't know 10:29 was "easy" and with the heat index his PR was even more impressive. Rowan is just having fun, he hasn't learned how to compete yet, but he likes his medals. Daddy Doug: Can you give some examples of a typical workout for your kids? James Castro: I try as hard as I can to keep the same workout for all 3 of mine, but have noticed recently I can't do that anymore! Braxton and Barkley are training for XC and will do one speed day a week on a track, but mostly it's tempo's and 5 mile runs this summer. Noah's workouts consist of speed on track twice a week and 3 mile runs 3 days a week. He does the ladder workout 200-400-800-1000-800-400-200 at 5k pace, with a 400 meter warm-up and cool downs. Key to this workout is the 100 meter recovery jog in between each run. It's a continuous run! I'm pretty sure this workout helps Noah with his crazy surges during some of his recent races. I know this might be too much info, but I've always been asked this question on Noah and this is the first time I've actually responded. Lol! A good amount of runners and coaches think he runs a lot more, but with all the basketball he plays (travel AAU team) he benefits from being the point guard and doing both has helped him progress at a fast pace. Only time will tell how fast he can be. If you ever seen him play basketball, you would understand. It will be a big decision on his part which one he chooses in high school and maybe even college. Daddy Doug: What influences did you and your wife play in their running life? James Castro: My Wife ran shuttles and high Jumped for Winfield in high school, but ended up cheering for Marshall University which is where we ended up meeting each other. She just started running about 6 months ago and has already finished about 10 5ks! I ran cross country and track for Huntington East and was also a hurdler turned mid distance runner in high school. I was a decent runner, with a great group of coaches and runners who gradually progressed. I was All State in 4x800, 89-90-9, and State runner-up in the 800 meter in 1991. It was hard to leave my single mom and sister and run for Wheeling Jesuit that next Fall, but everything happens for a reason. I ended back at Marshall after a year in Wheeling and ended up meeting Marie. I couldn't have planned it better myself! She's a partner for Arnett & Foster (Accounting Firm) in Charleston and I manage our rental properties which allow me to be home more with our kids! Daddy Doug: What got your kids into running? James Castro: I started running a few 5k's in 2009 to try and get back in shape. My kids usually tagged along for support and it wasn't long until Noah wanted to join me. My first thought was "Do I want to waste 25$ on a kid that's probably going to walk half this race"? I'm glad I forked it over! He did everything I thought he couldn't. 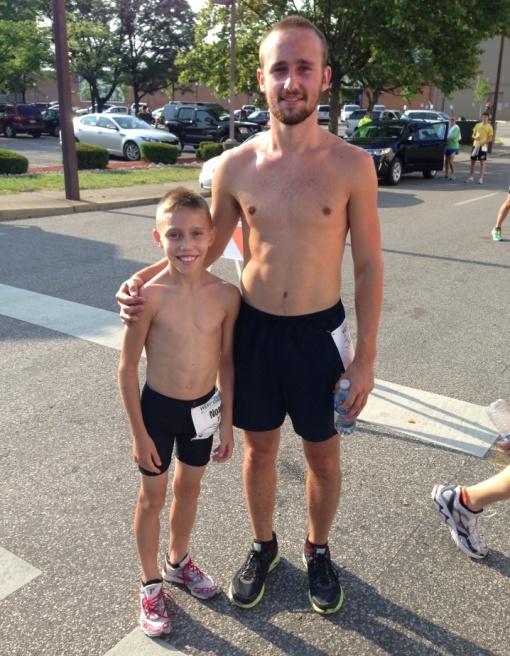 He ran a sub 22 min 5k at Tte age of 7. That's how he started! Barkley had to be convinced she could run over a 400, after being a hurdler in middle school & part of her freshman year! She wanted no part of cross country her freshman year, but ran her 1st 5k that fall with me in Huntington. She worked hard, built a base and came out ready to learn how to run mid-distance her sophomore year. This year’s cross country was interrupted by a shin injury that cost her half her season, but still had a big improvement over last year & it carried over this spring. Her undefeated Season in the half mile and #1 ranking was not by mistake! She knows what it takes to be a champion and we couldn't ask for a better ending! She has met every goal over 2 years and next year will be no different. It's simple...shave 5 seconds off her 800 meter run and put herself in position for a state record! She started her first summer of weight training last week and has a few road races on tap this summer along with a couple of AAU meets. 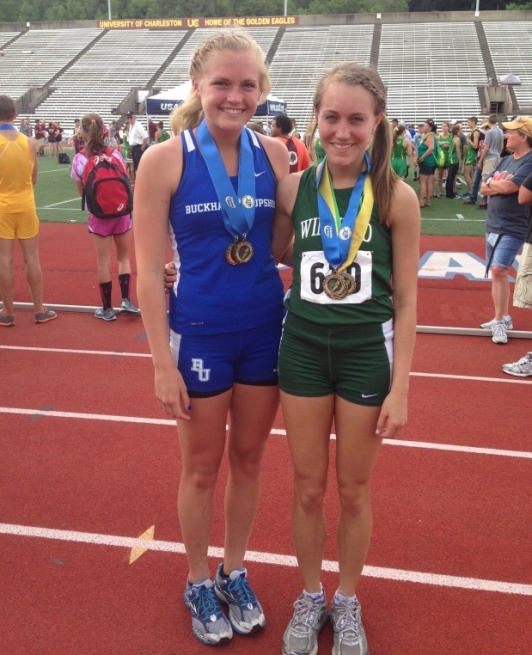 She is also trying to qualify for Nationals in the 2000 meter Steeplechase (Canton, OH June 29-31). Braxton is my oldest son, he started running cross country and distance in the 7th grade and has made big strides since joining Capital City Striders. My youngest, Rowan, is just getting started and doesn't have much of a choice. 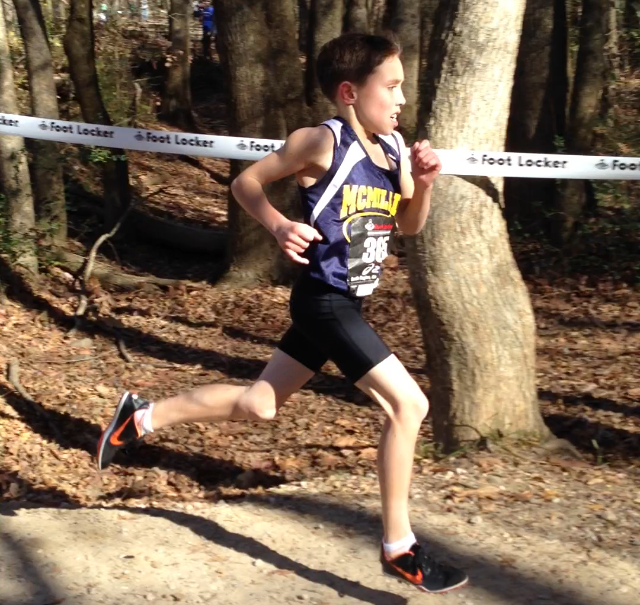 He's been tagging along his whole short life to a track or a cross country course and seems to enjoy competing. What and when are their next meets? Daddy Doug: Anything else you would like to add? James Castro: I almost forgot to mention the help of Capital City Striders and my friend Todd McMillion who was also a great high school runner. Both have helped me develop my children into the runners they have become! Thanks again for everything you've done for my kids and West Virginia Runners!